The Fou ndry, provider of award-winning creative software used globally by leading artists and designers, expanded its market reach while simultaneously bolstering the strength of its technology by acquiring Made With Mischief. 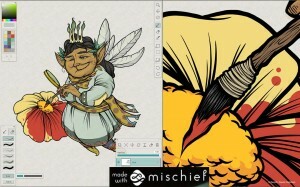 Its flagship product, Mischief, a pen-based sketching application for Mac and Windows, blends sophisticated underlying technology with an elegant, clean interface. This makes it easy for creative people to explore, create and share art in a digital format on a truly infinite canvas while preserving the emotional experience of the physical. Under the terms of the private deal, Made With Mischief, founded by Sarah Frisken, will become a wholly owned subsidiary of The Foundry. The company will be headquartered in Boston, with team members located in Boston, London and Shanghai. Read more of the announcement and watch the video here: http://www.thefoundry.co.uk/about-us/news-awards/the-foundry-acquires-made-with-mischief/ . Myron Kassaraba of MJK Partners, LLC, served as the lead transaction advisor to founder Sarah Frisken on the sale of 61 Solutions/Made with Mischief to The Foundry.